1 Choice 4 Quilting: Sweetwater Fabric Giveaway!! feature simplistic, hometown feels and are a symbol of primitive living! 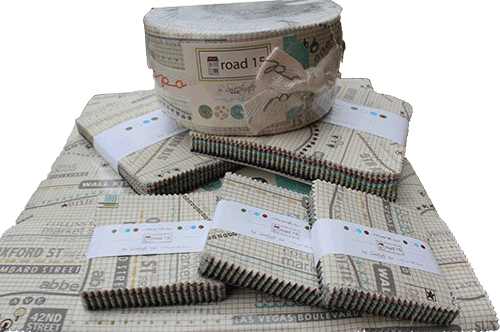 Sweetwater, who brought us the designs of Pure, Hometown and Noteworthy, are back again with their newest collection named Road 15. Road 15 was titled for the address of the childhood home where sisters Lisa and Susan grew up. Together with Mom, Karla, they are a family run design company located in Colorado. Road 15 combines the childhood addresses of sweetwater fans as well as adorable road, little houses and tree-lined street prints. Read more about what inspired them on the Sweetwater Blog. Their other latest fabric release is a sweet Halloween inspired collection called the Boo Crew. It reminds me of old fashioned, apple bobbing, costume parties!! And now onto the giveaway! To celebrate Sweetwater and the fabulous work that they do, not only is everything on sale through Saturday July 13th, 1 Choice 4 Quilting will give away two charm packs from the two latest Sweetwater Collections. The Second item is a charm pack from the Boo Crew Collection. 1. Please leave your first comment by sharing with us....What is the name of the street you grew up on and what is your favorite childhood memory? Mine is Walnut Street and playing hide and seek until dark =) I can't wait to read your comments! 6. I love Instagram! Do you love it, do you follow 1 Choice 4 Quilting. Let me know or start following! It's so fun! Photos really do say 1,000 words. This giveaway will end Saturday 7/13/13 at midnight and I will announce the Winner by noon EST on 7/15/2013. Next week the winners as well as another summer sew along will be announced!! I grew up on a few streets, but one was Booth, and I greatly enjoyed climbing the "mountains of Ararat" that were giant (to us at the time) 4-5 foot snow piles made by my dad's snow plow in front of my house with the neighborhood kids. West 6th St for me. I loved going to my grandparents farm, they were the best! I grew up on Peach Ridge. We used to have a big bell mounted on top of a post and when my mom wanted us home all she did was pull the rope on the bell.....you could hear that bell a mile away !!!! I grew up on Date Street. Loved to go swimming in our backyard pool for hours and hours. What great fabric lines! Love Sweetwater!! I follow your blog! :). Thanks for the giveaway! I grew up on a farm so no street name. Favourite childhood memory? Playing down by the river. and on Instagram. That's it I'm done! 933 T & P Lane. It was right across from the park, so there were many days..mornings and evenings spent there with friends.. loved those times. i grew up on Mary Lane and remember waiting for my dad to come home from work each day. 1c4q button is on my blog. Love sweetwater! I grew up on Myrtice Street and a favorite memory is playing "Kick the Can" on summer nights with the neighborhood kids. I grew up on more than one street but the one I lived on the longest was Foster Avenue. We lived in a very small house that my Granpa built when my mom was a young child. I loved being able to run across the street to visit my great grandma any time I wanted. Love Sweetwater! What a fun question. I grew up in Alaska on 40 acres. We had a P.O. Box as we lived in the wilderness, hehe. Our legal address was One mile North of Mile 62, Old Glenn Hwy. I really appreciate my childhood now. Grew up on a farm, lots of animals, hardwork and great family times. We walked a mile everyday to the highway to catch the school bus and a mile home everyday. Really! Thank you and Sweetwater or a super giveaway and the chance to win. Thank you and Seeetwater for a super giveaway and the chance to win. Thank you and Sweetwater for a super giveaway and the chance to win. I grew up on Bardonner Road. My great grandparents had a farm across the street and I used to love going over there to see the baby chicks in the hen house. Grew up on 23rd Ave and loved playing with the neighborhood kids. HI,GREW UP ON COTTONWOOD AND LOVED MY CLASSMATE FRIENDS! South Green Lake Road. Playing until our parents called us in. In the winter my dad put up a big spotlight so we could sled and skate later into the evening. We were always outside or inside crafting if it was too cold. I also enjoyed the later evening in the summer...I loved swimming after dinner. We lived at 123 Susan Drive when I was a kid, and roaming the neighborhood with the other kids was the BEST, ever! I'm a follower (giddy99)! thanks for the chance! I'm a follower on Twitter (@giddy99)! thanks for the chance! I'm a follower of your Facebook (giddy99)! thanks for the chance! The street I grew up on did not have a name, just a number, 1450 East. :) Kind of boring. I follow your blog, and I forgot to add my favorite childhood memory. That would be spending July 4th at my wonderful Great-Grandmother's house. Parade, carnival, barbecue, fireworks and cousins galore! I'm signed up for the newsletter! Thanks for the chance! I grew up on Kernodle and love riding my bike til dark! I grew up on 909 Eaton Street. And one of my favorite memories is playing tag after dark and catching fireflies in a jar. Oak Grove Road and eating ice cream cones on a hot summer day, no air conditioning in those days. I grew up on a street named Desmet and one of my favorite childhood memories was riding our bikes through the huge open field behind our house. Hours and hours of fun! I follow you on IG - that's how I heard about your giveaway. Thanks for the chance to win! My earliest childhood address was Cole St. My favorite memory of that time is walking to the beach every weekday in the summer with our lunches, and playing in the sand off Long Island Sound. I follow your blog with GFC, Feedly, and Bloglovin'. I grew up on Bibb Street. Catching "lightning' bugs" and putting them in a jar. I grew up in the country on Skillman Lane. There were lots of cousins living all around & we would get together, dig forts in the ground & have tomato fights. Didn't matter if they were green or very ripe, they got used. Love your new fabric & what a great way to celebrate the road you grew up on. I grew up on Brown Deer Trail. Some if my best memories are playing in our creek with cousins. I grew up on Grace Avenue and my best summer was spent at horse camp. Oh pick me!! I just started following on Instagram yesterday! I follow your blog in my Bloglines reader. I'm signed up to receive your newsletter. It was long street. I loved riding bicyles. The name of the street I grew up on was called Manitou. Forgot to tell you my favorite activity growing up... playing outdoor games like Frozen Statue, What Time Is It Mr. Wolf?, Kick The Can, etc until it got dark. I am very new to Instagram and just added you to follow my name there is Winkowl. I follow your blog already!!! I get your newsletter already too! I lived on Delhi Street as a child and my favourite memory is playing in the back street when everyone had their washing hung out. I grew up on a farm in the middle of nowhere - the nearest road was called the 'Perryway' - so called because we were in perry (a type of cider) country! Favourite childhood memories are always of den building and tree climbing! I lived on Oakwood Drive and I loved playing driveway hockey with my brothers and neighborhood friends (I was a bit of a tomboy). I grew up on 9th street and loved to climb trees. La Mielle Clement. The sprinkler on the lawn in summer. Mine is Wilson Valley Rd. my favorite memories involve my cousins. Waiting until right when the sun is going down and seeing the first lightning bug of the season. We spent countless hours chasing those lightning bugs all our our dads 40 acres of land. I grew up on Velmar Ct. No idea where that name came from. My favorite memory is playing Ghost in the Graveyard (basically tag after dark) with the neighborhood kids. I grew up on Mango Street and one of my favorite childhood memories is going to the park with my dad and swinging. I grew up on Longwood Drive and loved walking through the little "rivers" after a big rainfall. My childhood street was called Manchester Dr. I would love playing in the street (because you could then without worry!) with my friends playing 4 square! I lived in so many places as a child that I can't remember the streets. But my favorite memory is playing dolls with my three sisters. Thanks for the giveaway opportunity! I tweeted and I follow you on twitter. Thanks again. I love Sweetwater too. I grew up on Eat Pine Street. One of my many favorite memories is of multiple families going together to pick apples, or strawberries our cherries when in season. Load into station wagons and go!